Palpation is a must for equine veterinarians working on lame horses. 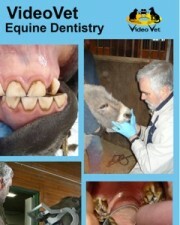 This DVD/CD both describes and illustrates how to perform a complete musculoskeletal examination of the horse. Palpation of the forelimbs, hind limbs, and the neck and back are demonstrated with particular attention paid to identification of abnormalities in the extremities distal to the carpus and tarsus. Correct application of hoof testers to both the fore and hind feet is illustrated because of the importance of this diagnostic technique. The method the author uses to perform a diagnostic acupuncture exam (DAPE) on horses with difficult or “performance limiting” lameness problems is also demonstrated. DVD has 16 Procedures/CD has detailed notes.